This report covers cresols (o-, m-, and p-), xylenols (major types: 2,3-, 2,4-, 2,6-, 3,5-, and others), and cresylic acids.Cresols are monomethyl phenols either as mono or mixed isomers ([o,m,p]-cresols), xylenols are dimethyl phenols either as mono- or mixed isomers, and cresylic acids are mixtures of both (cresols and xylenols) possibly with some higher alkylated phenols. These products are phenolic compounds or mixtures used as raw materials for a variety of synthetic applications, polymer intermediates, and also as solvents. Cresols and xylenols are obtained from a variety of sources. Generally, the two main avenues for obtaining cresols and/or xylenols are from natural sources (via coal tars, coal gasification extracts) or synthetic processes. Synthetic cresols and xylenols are produced by a variety of processes. Production of synthetic cresols and xylenols from toluene is considered the preferred route. 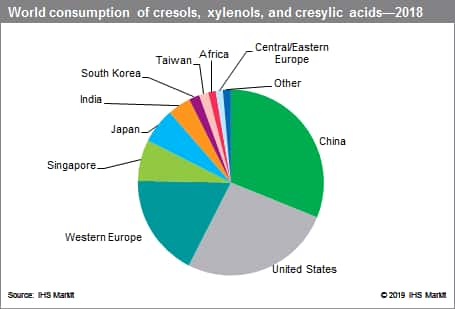 The major world consumers of cresols, xylenols, and cresylic acids are China, the United States, Western Europe,Singapore, and Japan, together representing nearly 89% of world consumption in 2018. China overtook Japan to become the third-largest consumer of cresols, xylenols, and cresylic acids in 2007 and surpassed the United States and Western Europe in 2014 to become the largest global consumer of cresylics. This increase in China, especially during the last 10 years, has been driven by (m,p)-cresols and xylenols; an indication of the industrial expansion in sectors such as rubber/elastomers and industrial machinery. Chinese demand for cresols, xylenols, and cresylic acids is expected to continue to increase during 2018–23. The largest all-around producer of cresylics is Sasol Phenolics (the former Merichem, a 1977 50/50 joint venture between Merichem of the United States and Sasol of South Africa). Sasol has large coal gasification facilities in South Africa that supply Sasol Phenolics with raw cresylics. The largest world producer of xylenols (mainly 2,6-xylenol) is SABIC Innovative Plastics with its production of 2,6-xylenol used to produce PPE (polyphenylene ether). Production units were located in the United States and the Netherlands; however, production in the Netherlands ceased at the end of 2013 when the company decided to shut down its PPO (polyphenylene oxide) asset in Bergen op Zoom and transfer the business to its US site in Selkirk, New York. This plant is scheduled to restart by the end of 2019, resulting in increased production of 2,6-xylenol. With regard to cresylics, there are three major types of companies involved—those that generate raw product, those that isolate product, and those that produce it by synthetic processes. Large generators of raw cresylics include Dakota Gasification Company (United States), Sasol (South Africa), and Sokolovská Uhelná, Právní Nástupce, a.s. (Czech Republic). Major isolators from cresylics and coal tars include Sasol Phenolics mbH (Europe), and C-Chem Co., Ltd. (Japan). Major producers of cresylics by synthetic processes include SABIC Innovative Plastics (United States), SI Group (United States), LANXESS (Europe), Asahi Kasei (Singapore), and Mitsui Chemicals, Inc. (Japan). Nippon Crenol Co., Ltd. (Japan), another important producer of this category, closed its Kawasaki plant in early 2012. As a whole (cresols, xylenols, and cresylic acids), the annual capacity as of 2018 is sufficient to meet expected growth in world consumption through 2023. The market is continuously consolidating, with consumption shifting to China, India, and other Asian countries (excluding Japan); fast-growing markets in China include BHT, PPE, and wire enamels. Captive consumption continues to play an important role in this market as several companies use part of their cresols captively for the production of antioxidants (such as Sasol and LANXESS) or their xylenols captively for the production of polyphenylene ether (PPE/PPO) resins (such as SABIC and Asahi Kasei).